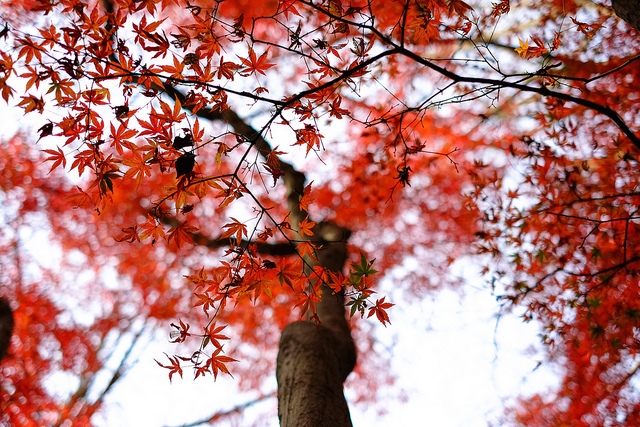 5 Places to Feel the Autumn in Tokyo! Do you like the Arts? Then go to Nezu Museum. It exhibits not only Japanese arts but also East Asian ones a lot. It established in 1941 and holds around 7400 arts (7 National treasures, 87 important cultural properties, 94 important crafts). The garden around 20 thousand square meters is also recommended. Why don’t you take a rest with tea at Nezu Cafe after walking there? It is counted as Edo (the old name of Tokyo) two large gardens along with Koishikawa Korakuen. The green trees are rampant and it created a scenery of Chinese trees. In autumn, the colorful leaves are lightened up at night. The open hour is extended. It’s nice to have relaxing time with a cup of tea. It’s the park which Tokyo government set and located between two cities, Musashino city and Mitaka city. It takes only five minutes from JR Chuo line and Keio Inikashira line Kichijoji station. If you like to spend silent time in the park, go there in the early morning since there are many people and street shops around the noon. The park is large. So you can enjoy autumn titnted leaves while taking a walk. Make a circle walking along the pond there. It’s a famous place for viewing cultural and artistic things. Here’s also a sports activity place, for instance, ice skating, baseball stadium called Meiji Jingu Kyujo, a golf practice zone. The park Nikoniko park is located for children as well. In fall, the road (300m) from Aoyama street is full of ginkgo leaves. The ginkgo festival is held in the middle of November. It’s a little bit far from central Tokyo, which takes 30-40min from Shinjuku by train and bus. It’s a large and elegant park. You will have a good time there by seeing idyllic sceneries. In the middle of October, a festival naming after Shindaiji temple soba noodle is held. The park is suitable for autumn leisure spot as a secret place! Gaijin Perspective: 5 Odd Customs in Japan! Cuteness Overload! The 10 Most Popular Animals in Japan!